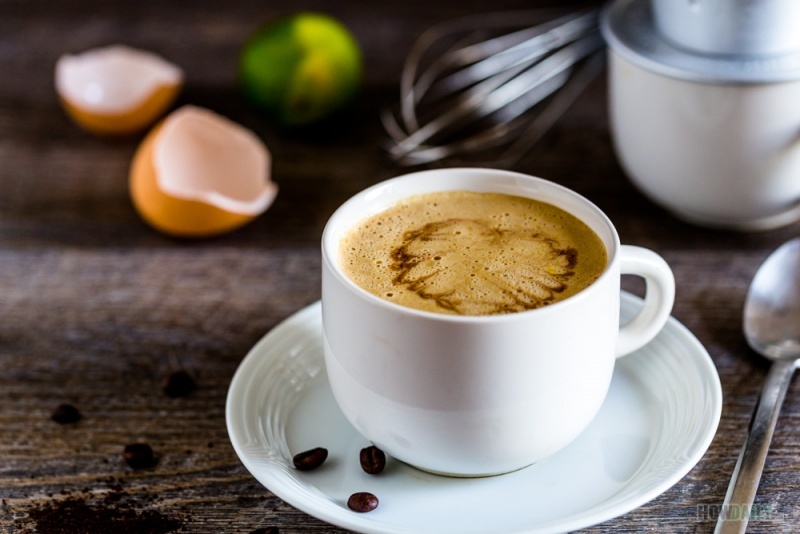 For over 70 years, Vietnamese Egg Coffee has brought the special mesmerizing beauty of coffee to not only the local, but the whole world of travelers too. Invented by a Metropole chef in the last century, this drink has become so popular now that most travelers would come back for more. There are many ways to blend this drink, but the most original one was what most people sought to achieve. Main ingredients are just Vietnamese Robusta coffee filtered in Vietnamese “Phin”, sweet condensed milk, and egg yolk. The whole point here is to concoct the drink with egg as substitution to the normal cream and/or milk without the egg fume. Mostly you would have remove all the egg white, eye, and all gel layer to keep the egg smell away. Beat the egg with hand mixer or blender over high speed at the desired time would help too. Extra additive like salt, lime juice, sugar, honey or cream of tatar are many of the ingredients use in baking to counter egg smell. Also, temperature tends to lessen the smell and keep the foam up too, that’s why back in the day before mixer arrive in Vietnam, they mostly serve hot egg coffee. Now, the varieties are there to wonder. 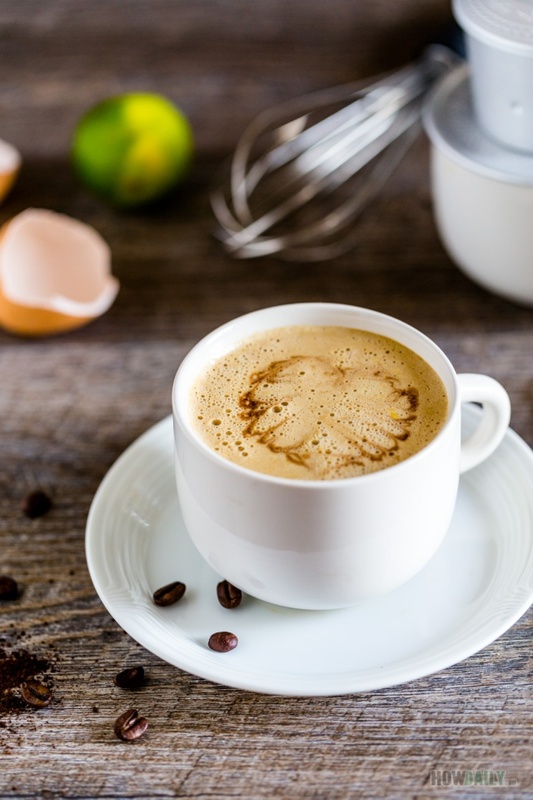 In this recipe for Vietnamese egg coffee, I would star with how to brew for coffee, beating egg foam and then divide into both hot and cold egg coffee serving. It takes time and skill to perfectly beat the egg, so don’t afraid to try. Brew coffee with a phin as show in this Vietnamese coffee. Pre-rinse the filter with 1=2 Tbsp of hot water. Add coffee, tap filter body to level. Place damper and lightly pressure it. Add sweeten condensed milk into cup. Affix body filter onto its base dripper, then place on microwave able cup. 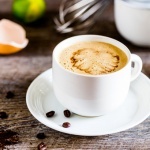 Add 1 Tbsp of boil water into body filter to soak coffee for 15-20 seconds. Pour about 60 ml of boiling water into body filter, close cap. 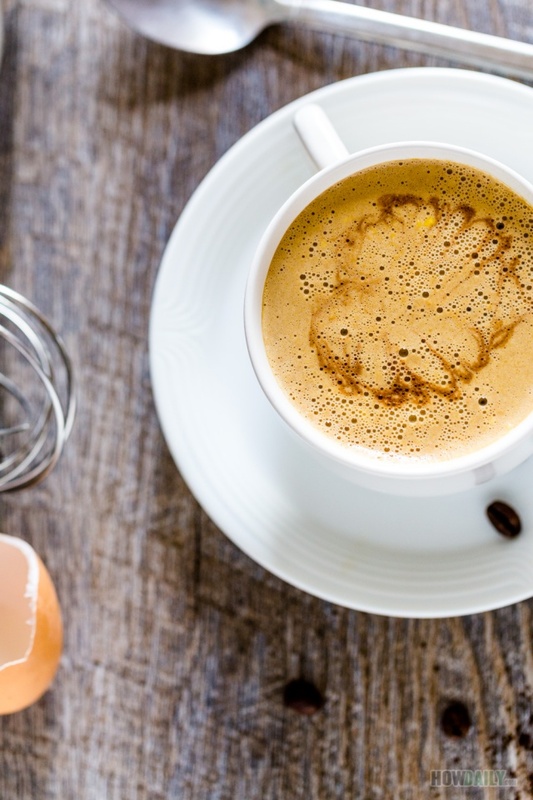 While coffee is dripping, separate your egg to obtain fresh yolk. Make sure your yolk is free of the egg white, eye and all the white gooish stuff. Whisk or beat it rigorously until bubbly up. Add 1/2 tsp sugar and some drop of lime juice while beating. When egg yolk is smooth and fluff pour into serving cup. Prepare a warm water bath by pouring hot water into a ceramic/stone bowl. Place serving cup with egg fluff in this bowl. Microwave the coffee for 30 seconds to make sure it is hot. After finish dripping, pour coffee into egg serving cup. Serve with a side crushed ice cup.